In addition to the Compostela, the Pilgrim’s Reception Office offers pilgrims the Certificate of Distance, a document issued by the Chapter of the Cathedral of Santiago certifying the number of kilometres they have travelled, whatever the starting point of their pilgrimage. This new document reflects the desire that many pilgrims have expressed for several years to have an official record of more details of their pilgrimage. It indicates the day and the starting point of the pilgrimage, the kilometres covered, as well as the day of arrival and the route of the pilgrimage. It can also be requested by those who have made the pilgrimage before. This certificate of distance costs 3 €, it is slightly larger than the Compostela and is printed on parchment paper. It is decorated with a phrase in Latin and a thumbnail, both from the Codex Calixtinus. 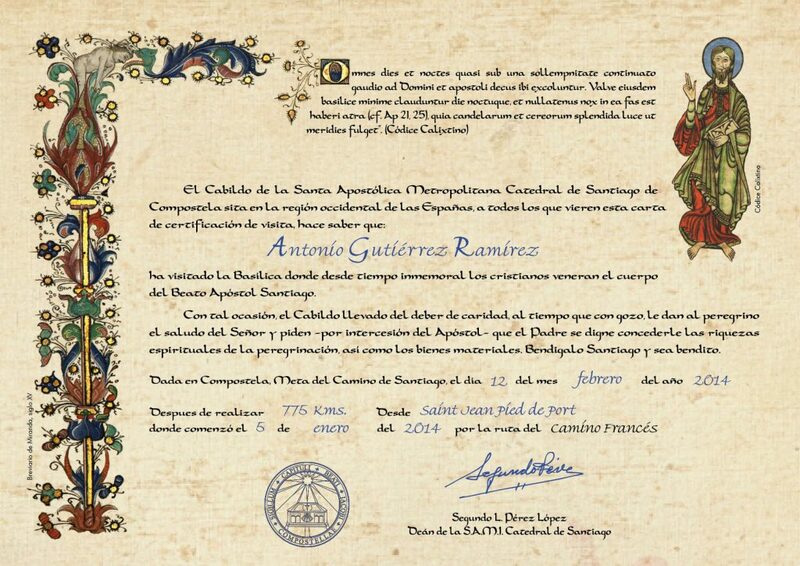 Both the pilgrim’s reception service and the issuing of the Compostela are completely free, so the sale of these certificates helps to continue providing this service to the pilgrimage from the Cathedral of Santiago de Compostela.